We came back from a Californian Honeymoon last month and i've been itching to share some of my tea-spotting moments since then. 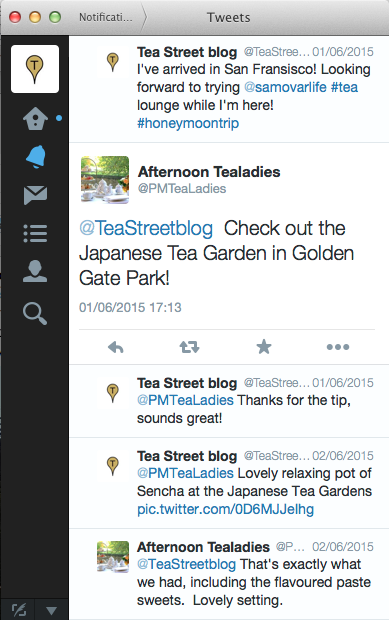 Once we landed and got settled into our hotel in San Francisco, the Afternoon Tea Ladies tweeted me a recommendation for the Japanese Tea Gardens. Once we found the Japanese Tea gardens, we were parched and relieved to see this little oasis of tranquility. I decided to go for the Sencha tea, mainly because I wanted to use a Yokode Kyusu, or handled teapot. Only it was a bit tricky since i'm left-handed! We also ordered the Sencha and Matcha iced tea and some delicious Kuzumochi sweet rice cakes. Rice cakes sounds like the cardboard circles we get in the UK, but these were more like turkish delight in texture. Once we'd rested, we had a stroll around the Zen Gardens before heading back. ...So that's all for today but I have a couple more places to share soon!